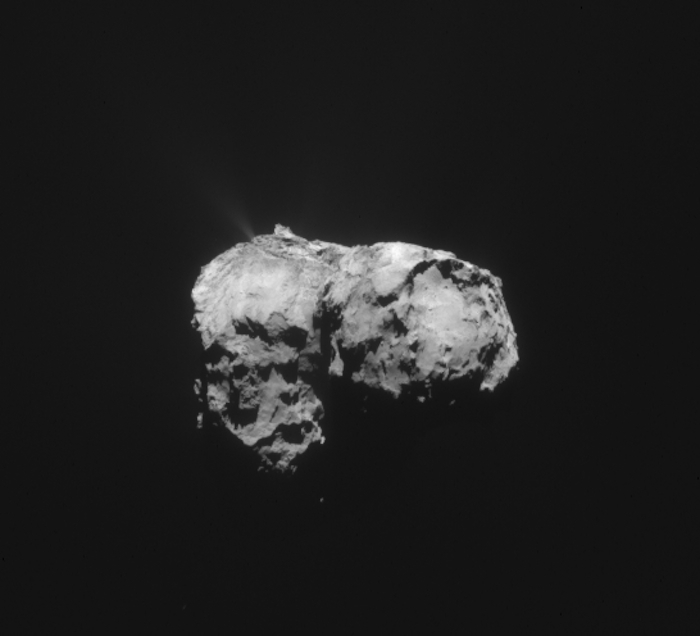 This time last year little was known about Agilkia, the area chosen as Philae's landing site. One year on and the situation has changed, thanks to remote and in-situ measurements that have contributed to building up a picture of this iconic area on the comet. As can be seen from the many results reported in this blog, Rosetta is providing unrivalled information about the surface of comet 67P/Churyumov-Gerasimenko. One team has been looking in particular at the region around where Philae touched down in order to put the lander's results in their correct global context. Agilkia was the name chosen for the 1 km^2 landing ellipse at which Philae was targeted. Last year, as Rosetta drew closer to the comet, smaller and more distinct terrains within this ellipse became apparent. Fiorangela La Forgia, of the University of Padova, Italy, and colleagues have studied images from OSIRIS, the science camera on Rosetta, to define these areas according to their geological appearance. On 12 November 2014, Philae touched down as planned in Agilkia, within a region named Ma'at. (Comet regions, defined according to their geomorphology, have been named after ancient Egyptian deities.) It then rebounded, and after two hours drifting about 100m above the comet surface, it settled into its final position, named Abydos and thought to be located on the other side of the Hatmehit region, close to the border with Bastet. From OSIRIS images, we see that Ma’at, and the neighbouring region Nut, are mainly covered by smooth deposits of fine-grained material. The size of these grains was revealed by the ROLIS images from Philae to be of the order of a few centimetres. Although the depth of this layer is unknown it is probably highly variable across the comet: a 35 m-wide impact crater in the Ash region shows that the depth there may reach several metres, whereas in other places, the view across walls of more compacted material suggests that the layer is thin. This layer may be the result of 'airfall', which is produced when dust is ejected from the surface but lacks the necessary velocity to escape from the comet. Instead it falls back, dusting the surface. There are a number of longitudinal dune-like structures visible in the Agilkia area, which seem to indicate the drift-paths for this airfall. This is unusual on comets and may be the result of a prevailing 'wind' direction in the comet's gas activity. Fiorangela and her colleagues mapped the local gravity across the Agilkia area and conclude that the dunes are not caused by dust piling up under the effect of gravity because the regions concerned are almost flat. The Agilkia area also contains some pits. These are smaller than another population of pits already observed on the surface of the comet, which may arise from the surface collapsing to form sinkholes, and which sometimes generate jets of material that spray from the comet. One suggestion is that the smaller pits are related to ice. 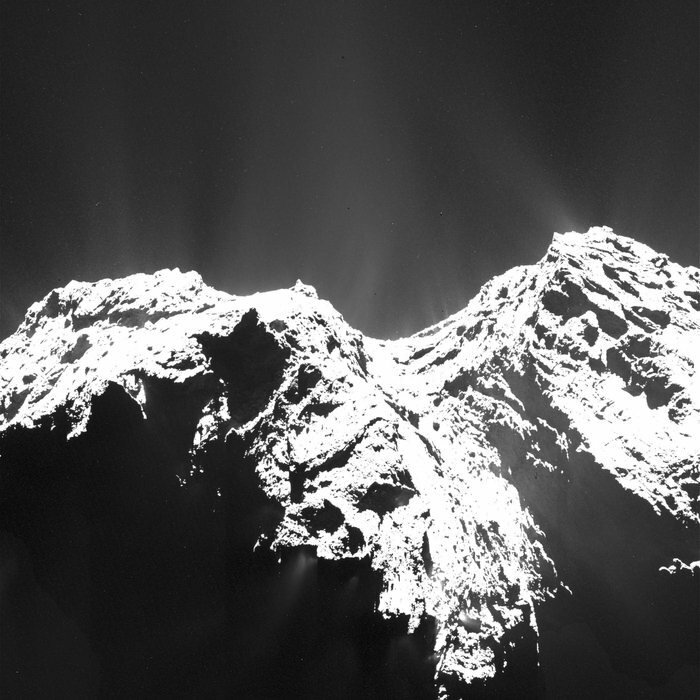 Several bright spots have been seen on the smooth dusty plains that run across 67P/C-G’s surface. The most obvious interpretation of these is that they are icy chunks of comet material that have been partially buried by the airfall. Subsequently, as the comet approached the Sun, the added energy has caused them to sublime. This ejects the fine dust particles too, leading to the excavation of the pits. A geomorphological map of the area referred to as Agilkia. The main geological units have been identified on the basis of their shape and structure. Much of this area, which includes the Ma'at and Nut regions, is covered by smooth deposits of fine-grained material (indicated in pink). Dune-like features (magenta lines) within these regions seem to be aligned in a similar direction suggesting that there is a prevailing direction associated with the comet's gas activity. 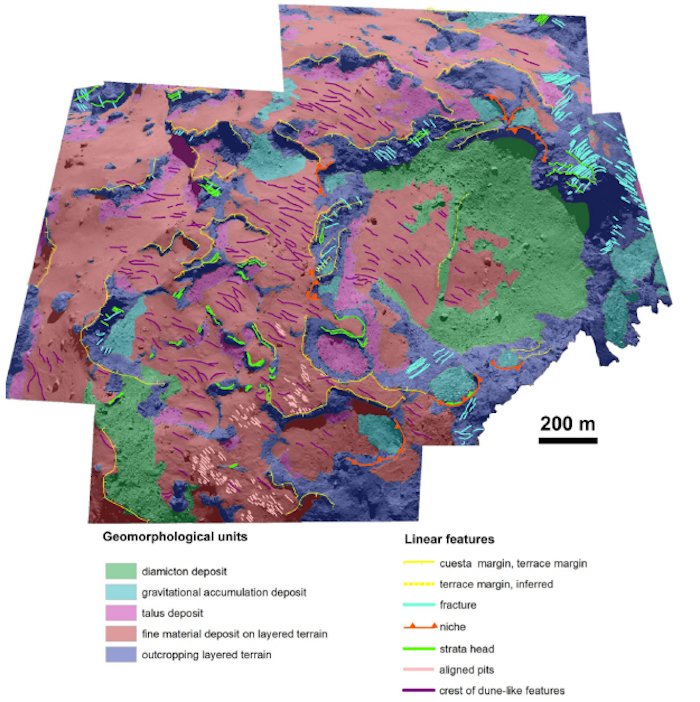 The formation of chains of small pit-like features (pink lines) is attributed to the effect of sublimation of icy chunks. Deposits of fine and coarse material (light blue) are observed at the foot of various outcrops (yellow lines). This could be due to the accumulation of material arising from local gravitational slopes. Within the large Hatmehit depression the greater part of the floor is covered with fine material mixed with boulders – this is referred to as diamicton. Much of the remainder of the floor is covered with fine-grained material forming dune-line structures, as seen in Ma'at and Nut. A detailed description of the features of this region can be found in "Geomorphology and Spectrophotometry of Philae's Landing Site on Comet 67P Churyumov-Gerasimenko" by F. La Forgia et al., doi:10.1051/0004-6361/201525983, published in the Astronomy and Astrophysics special issue on Rosetta mission results pre-perihelion. There are also widespread outcrops, such as cuestas (hills with a steep slope on one side and a shallow slope on the other side), terraces and steep walls, around the region where Philae touched down, as well as many boulders strewn across the surface. Philae is thought to have finally come to rest in the Hatmehit region, close to the border with Bastet. Although the exact location is still a matter for ongoing investigation, Hatmehit itself is a circular depression that is covered with dune-like features and boulders of various sizes. The nature of this depression is still unknown. From their study of the region, Fiorangela and colleagues conclude that it is not an impact crater but could be an area that sank following the sublimation of sub-surface ices. As well as looking at the form of the landscape in Agilkia, the team also looked at the photometric properties, to gauge how much light the surface reflects at different wavelengths. The simple answer is: not a lot. The landing site shows an average reflectance of just 0.96% in the orange band (649.2 nm; one of five filters on the OSIRIS camera). The team reports that there is a marked similarity between the geological units and the reflectance. In particular, smooth deposits have the highest reflectance compared to the outcropping material. These readings are compatible with the surface of the comet being composed of organic material (as reported by the VIRTIS team earlier this year) that shows only small local variation. Nevertheless, Fiorangela and her colleagues suggest that this variation must be the result of small differences in the organic compounds that are present because the combined reflectance and colour variations cannot be explained by surface texture and grain size alone. Put together, these results present a growing picture of the overall geological and compositional properties around the Philae landing site. As such, they will allow the science teams to put the specific details of the lander's measurements into a global comet context. Philae’s SESAME-CASSE ‘listened’ to the lander’s MUPUS instrument hammer the surface of Comet 67P/Churyumov-Gerasimenko last November. Martin Knapmeyer from the German Aerospace Centre, DLR, tells us more. SESAME-CASSE is the Cometary Acoustic Surface Sounding Experiment located in the lander’s feet. It takes the form of three accelerometers, each of which records acceleration in three directions (one vertical and two horizontal). 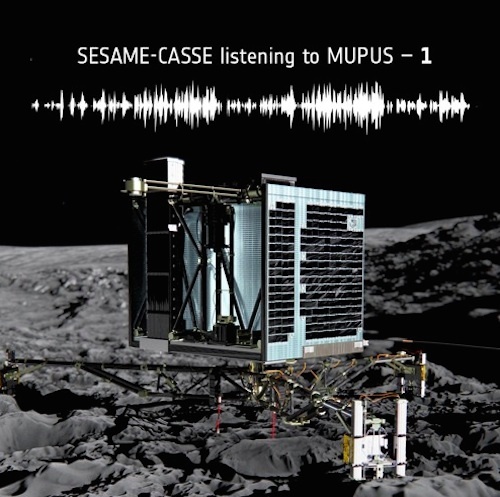 MUPUS comprises the Multi-Purpose Sensors for Surface and Subsurface Science – including the MUPUS penetrator that was activated towards the end of Philae’s first science sequence on 14 November 2014. It was recognized early in the preparation of both experiments that the hammering mechanism of MUPUS, which drives a thermal probe into the comet’s surface, would serve as an acoustic source for ‘sounding’ the subsurface with CASSE. The determination of the propagation velocity of sound would allow scientists to look at possible layering in the comet’s surface and subsurface materials, important for understanding its evolution. The CASSE instrument listened to the hammering of MUPUS for 2h 15 min. Due to memory limitations, CASSE was not able to take continuous recordings, but only a few seconds at a time. Several waiting periods were also included to give MUPUS time to reach depths of 10 cm, 20 cm, and 30 cm. A total of 15 hammer strokes were recorded, and one of the recordings contains two signals (the first sound, left, is heard at about 3 and 9 seconds respectively). The time between the strokes matches the charge time of the hammer mechanism expected at that time, thus this particular recording proves that CASSE was really recording hammer strokes. The second sound file (below) contains hammer stroke no. 129 (as determined from the MUPUS housekeeping catalogue), which was recorded on Philae’s +Y foot. This stroke was executed at the highest energy level of the hammer system. All three channels of the +Y foot are mixed into the sound file, which is presented at real playback speed, in stereo. The signals on the other two feet were, in this case, much weaker and their recordings would mainly add to the background noise. By looking at the strength and quality of the signals received by each foot, conclusions could be drawn about the orientation of Philae on the surface of the comet. Signal quality differs between feet, but several strokes were recorded on all three feet. From this the CASSE team concludes that all three feet of Philae have mechanical connection to the surface. The CASSE team can also rule out that signals propagated through the structure of the lander only, since we see arrival time delays of several milliseconds between the individual feet, while delays due to asymmetries in the lander would amount to less than the sampling interval (i.e. microseconds). Signals traveling through Philae's structure would thus arrive synchronously at all feet rather than foot by foot. “The CASSE listening experiment has proved to be the first active seismic experiment conducted on a celestial body since the lunar seismic profiling experiment carried out by Apollo 17 astronauts on the Moon in 1972,” says Martin. 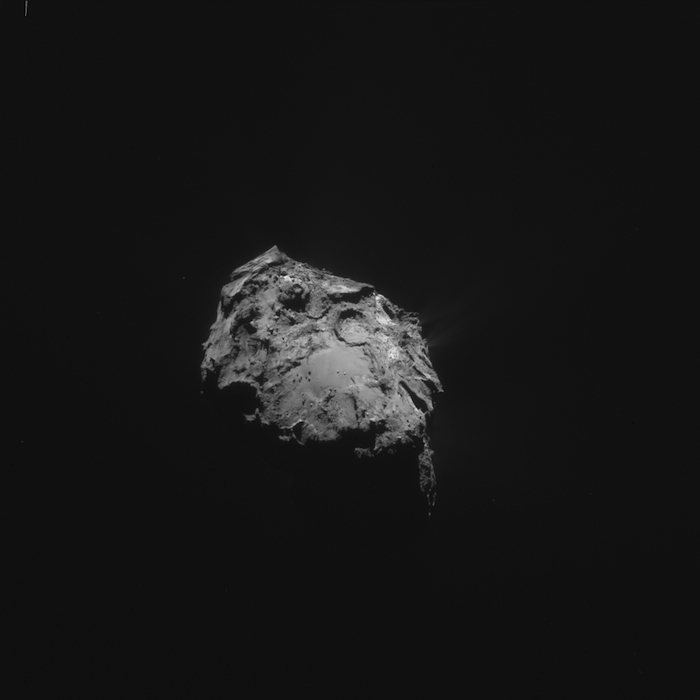 Today’s CometWatch entry was taken yesterday by Rosetta’s NAVCAM, on the anniversary of Philae’s historic landing on Comet 67P/Churyumov-Gerasimenko last year. The image was taken from a distance of 177.7 km; the image scale is 15.1 m/pixel and the image measures 15.5 km across. It has been lightly enhanced to better show the comet’s activity. 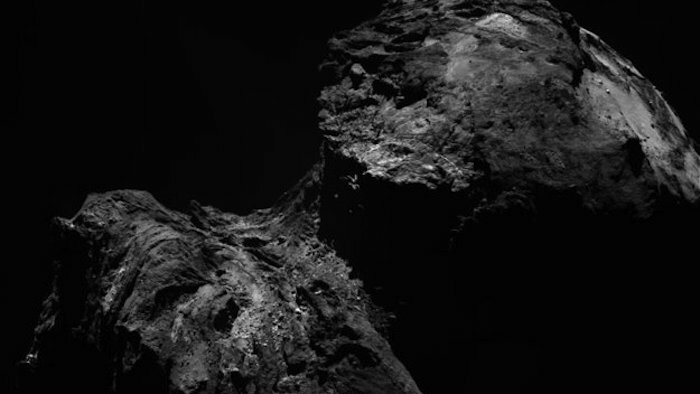 With Rosetta closer to the comet, more surface details can be seen again. On the large lobe, to the left, the relatively flat surface of Aker can be seen to the top, with Khepry to the left and Babi in the foreground. Hints of Anhur can also just be seen beyond Aker. On the small lobe, the circular depression Hatmehit takes centre stage. Philae’s first touchdown point, Agilkia, is to the lower right of Hatmehit in this orientation, with its final landing site, Abydos, towards the horizon at the top of this view. In case you missed it yesterday, a new animation was released by the lander teams depicting Philae’s impressive flight across the surface of the comet from Agilkia to Abydos. 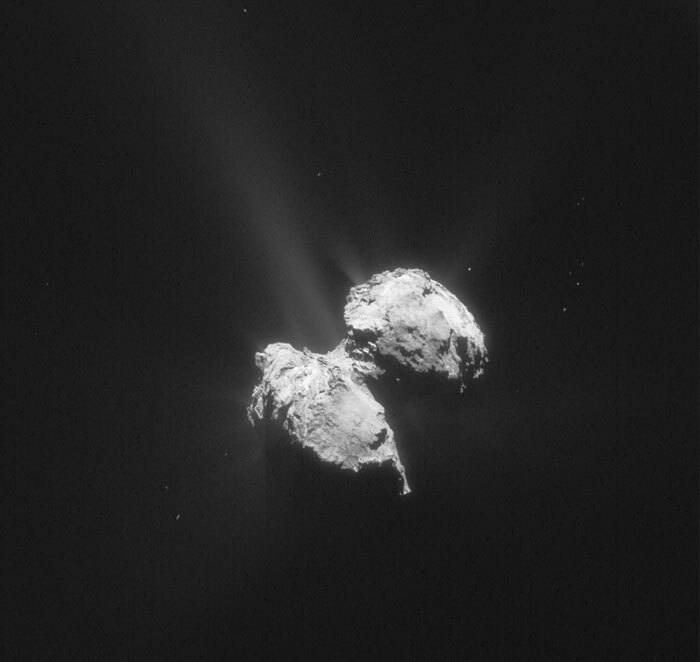 More about the outlook for Philae – and Rosetta – in the months and year ahead can be found in our comet landing anniversary article, here. Today's CometWatch entry is a NAVCAM image taken on 17 November 2015, when Rosetta was 141.4 km from the nucleus of Comet 67P/Churyumov-Gerasimenko. The spacecraft has not been this close to the nucleus since weeks before perihelion, when the increased amounts of dust due to enhanced comet activity started interfering with navigation and Rosetta remained at larger distances from 67P/C-G. The scale is 12.1 m/pixel and the image measures 12.3 km across; the contrast was increased to bring out the comet's activity. In this orientation, the large comet lobe is on the lower left, and the small lobe on the upper right. Outflows of dust are visible around the nucleus, particularly to the left. On the small lobe, the circular depression of Hatmehit is well in sight, pointing to the upper right corner of the image, with the rougher terrains of Bastet visible below and the Wosret region to its left. Abydos, the final resting place of the lander Philae, is roughly at the centre of the small lobe in this view. Hints of Sobek are visible on the comet's neck; on the large lobe are parts of Babi (right), smooth areas on Aker and Khepry (centre), and the more rugged Anhur and Khonsu (left). 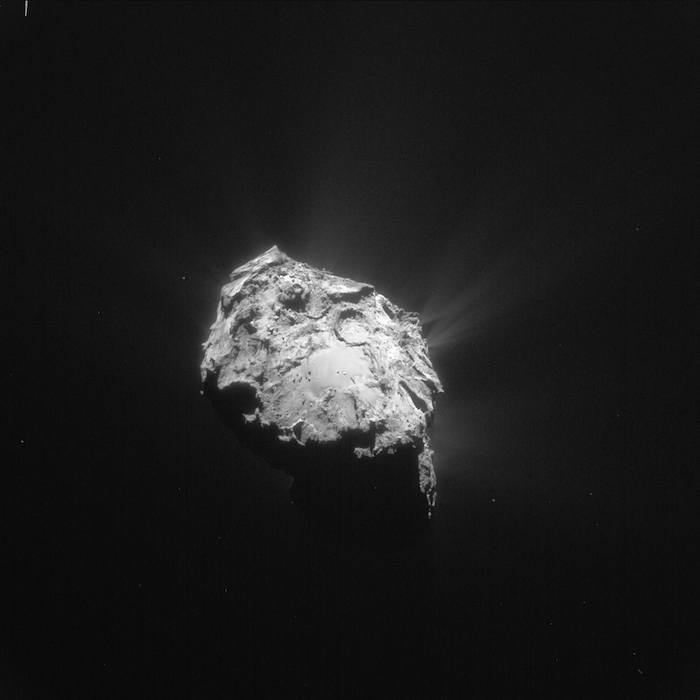 This week’s Cometwatch entry was taken by Rosetta’s NAVCAM on 22 November 2015 when the spacecraft was 127.7 km from the nucleus of Comet 67P/Churyumov-Gerasimenko. The scale is 10.9 m/pixel and the image measures 11.1 km across. The contrast has been lightly enhanced to bring out the comet's activity without losing details of the nucleus. A prominent active region is clearly visible towards the horizon on the right of the nucleus in this orientation, close to the comet’s ‘neck’. Although faint, several diffuse jets of activity can also be seen emanating from the Imhotep region, which is cast in shadow in the foreground. Stretching the contrast of the image even further will reveal these active regions more clearly (but will wash out the nucleus). The comet nucleus is oriented with much of the southern hemisphere visible, facing ‘up’. On the small lobe in the background, the relatively flat region of Wosret can be identified, with a transition through Sobek on the neck into Anhur on the large lobe in the foreground. 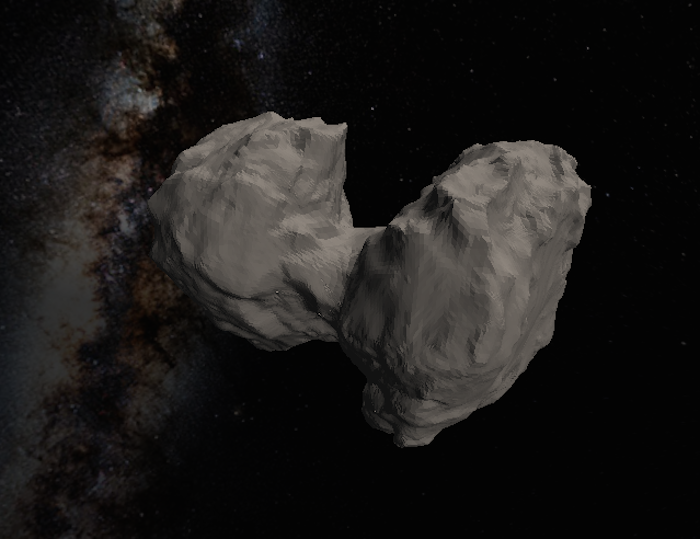 A new 3D shape model of Comet 67P/Churyumov-Gerasimenko has been released by ESA’s Rosetta archive team today. 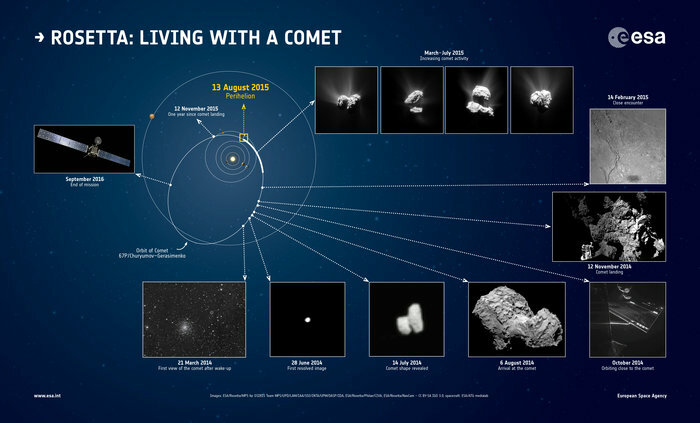 The model includes images taken by Rosetta’s NAVCAM up until mid-late July 2015, and reveals parts of the comet’s southern hemisphere that were not included in earlier shape models. The release also includes .WRL, OBJ, STL files, which can be used for 3D printing. At the same time, 681 images have been added to the Archive Image Browser covering the period 6 May to 30 June 2015 as part of ESA’s regular monthly release of NAVCAM images. During this period the comet was heading towards perihelion on 13 August, the closest point to the Sun along its orbit, and so the images capture some details of the comet's increasing activity. Caption: The latest Archive Image Browser release. Click to enter browser. 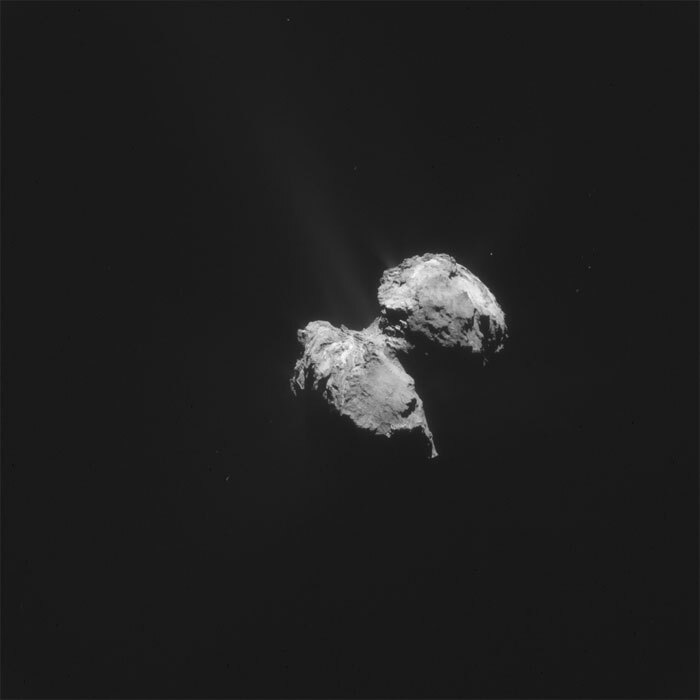 All images: ESA/Rosetta/NAVCAM, CC BY-SA IGO 3.0. Taking into account the upcoming seasonal holiday, the next NAVCAM archive release will be made early-mid January 2016. For background information on what a shape model is, read our blog post: A shape model – what’s that? We hope you enjoy using the updated shape model – do let us know if you've used it for your own projects, or if you have any questions about it, by writing in the comment box below. 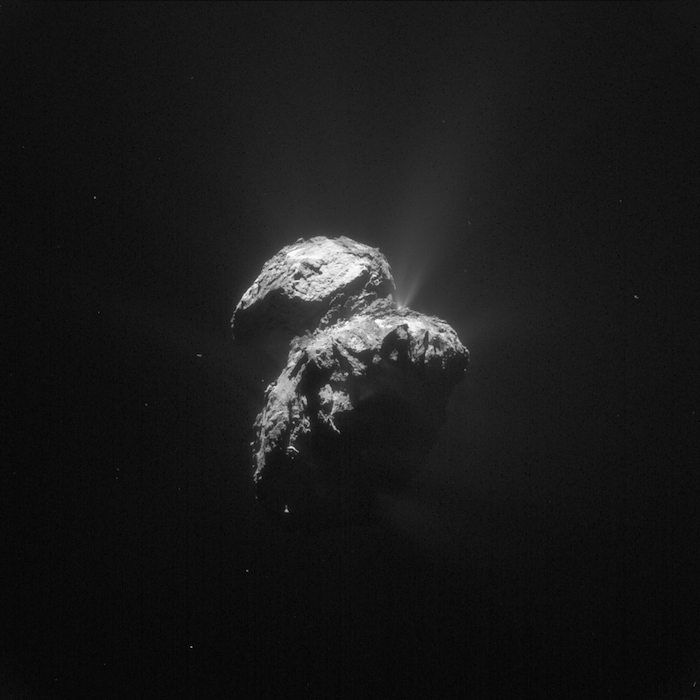 This week’s Cometwatch entry was taken by Rosetta’s NAVCAM on 27 November 2015 when the spacecraft was 124 km from the nucleus of Comet 67P/Churyumov-Gerasimenko. The image scale is 10.6 m/pixel and the image measures 10.8 km across. The contrast has been lightly enhanced to bring out the comet's activity without losing details of the nucleus. The image shows a beautiful view of Imhotep on the comet’s large lobe, but with the resolution of NAVCAM at this distance it is not possible to make out the same level of detail as seen in the OSIRIS images depicting changes in the smooth, central portion that were observed in this region before perihelion. Perhaps the most eye-catching features of the image are the two groups of jets fanning out from the comet’s top-right horizon. Less defined jets can also be seen all around the sunlit horizon. 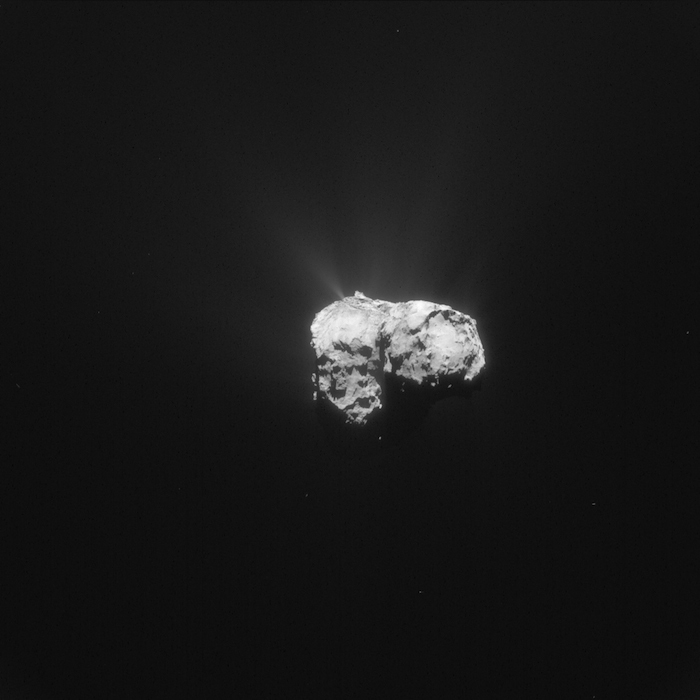 The silhouette of the comet’s small lobe is also visible against the background ‘glow’ of activity towards the bottom left of the image. 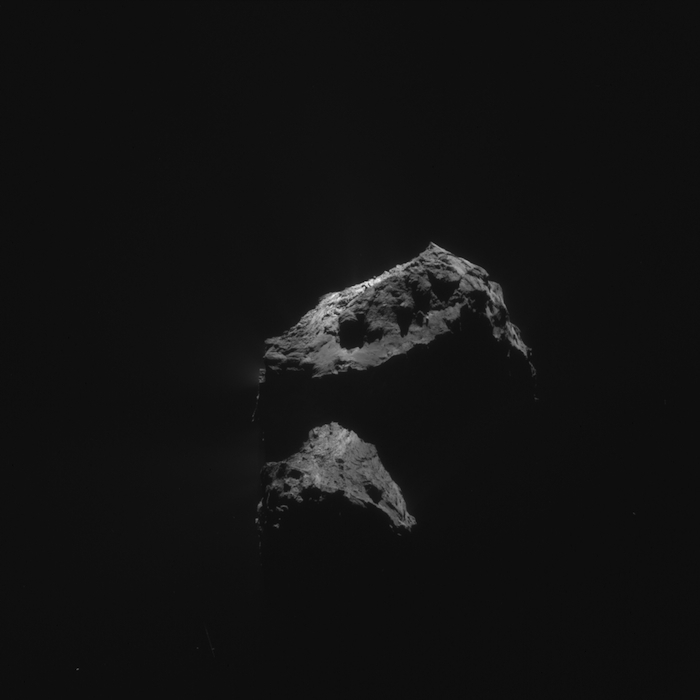 Today's CometWatch entry is a NAVCAM image taken on 7 December 2015, when Rosetta was 103.1 km from the comet nucleus. The scale is 8.8 m/pixel and the image measures 9 km across. The contrast was increased to reveal the beautiful details of the comet's activity, especially on the upper and left sides of the nucleus. With the large lobe up and the small lobe down, this image shows an interesting view of the comet and a stunning juxtaposition of lit and shadowed areas on the surface of 67P/C-G.
On the large lobe, the image offers a great view on the smooth terrains of Anubis and, further away, on the more irregular region of Atum. Towards the right, hints of Ash are also visible. In this curious orientation, the two lobes appear as if they were separated, with the regions between them – Seth, on the right, Hapi at the centre and Sobek towards the left – cast in shadow. On the small lobe, the view is dominated by the complex terrains of Anuket. We can hardly believe we are approaching the end of yet another incredible year for the Rosetta mission, which has now spent nearly 500 days “living” with Comet 67P/Churyumov-Gerasimenko. From dramatic close flybys to the peak of comet activity during the months around perihelion, 2015 has seen the Rosetta mission shine with scientific discovery. A slew of fascinating results have been published from both the Rosetta orbiter and the Philae lander teams in the last year, which have certainly triggered some intense discussion in the comments section on this blog! As we did last year, we are planning to take a short break, between close of business on 18 December 2015 and 4 January 2016. During this time we don’t foresee any routine updates (aside from images that might be released via the new "OSIRIS image of the day" website), but we will of course inform you as soon as possible if something extraordinary happens. Due to the time required to review comments, the commenting function will be disabled on all posts and pages over this period – existing comments will remain, but no new comments can be submitted and added during the break. Furthermore, when we return in the New Year, the comment function will only be possible on subsequent new posts. We therefore kindly encourage you to wrap up existing conversations during this week. It’s been a pleasure sharing the latest news with you this year and we’re delighted that so many of you are continuing to enjoy following the blog and being part of the Rosetta adventure with us here. Many thanks to our regular contributors and occasional visitors alike – we look forward to welcoming you back in the New Year when we’ll be getting ready for the mission’s greatest challenge yet: putting Rosetta on the comet in September 2016. But for the rest of this week at least, it's business as usual!